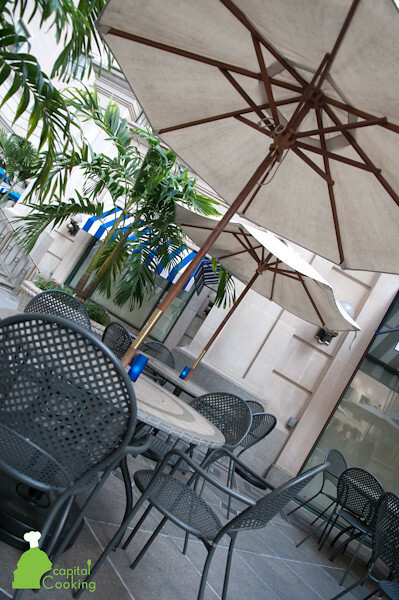 Cafe Dupont: Cafe Dupont offers a large patio with French influenced fare from Chef Silvan Kraemer. The Alan's Love cocktail is light and refreshing. Lost Society: Lost Society is just what the U Street neighborhood needed with a beautiful roof top for dining and drinking. Get some steak! Madhatter: Chef Freddie Melgar joined Madhatter to bring a little pizazz to the menu. Sit out on the patio and enjoy the Tuna Sashimi with Asian sesame vegetables and a cilantro vinaigrette. Jack's slow roasted bbq pork sliders are delicious. The menu still has your old favorites, but it is now brightened up with some new delights. El Centro D.F. : Great roof deck for drinking margaritas. ADC: Situated on the rooftop of Donovan House, ADC has amazing views and specialty cocktails. A selection of the Zentan menu is also available at ADC. During the daytime the pool is reserved for guests, with the pool bar open to guest and locals in the evening hours. RedRocks: RedRocks is a cute Columbia Heights neighborhood spot that is great to enjoy some outside patio time. The brick oven pizza is outstanding. The patio is the perfect place to sip beer and eat pizza. Tabaq Bistro: Tabaq has delicious Mediterranean tapas. The service is spotty, but the beautiful roof-deck has breathtaking views of the city. The Poste: Really fun bar inside Hotel Monaco with a great outdoor space. Good cocktails, but a little pricey. The Standard is my fav! Celebrate Greek Easter at Zaytinya! Don't miss my favorite food event of the year!